List of the writing systems in alphabetical order. An alphabetical index of important places referred to in this site. The writing systems grouped together in geographic areas. Lists of the languages in alphabetic order. General information about the origins of the writing systems and their typologies, techniques and the writing materials used. 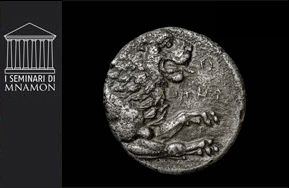 On April 16th starting at 11,30 a.m. in Scuola Normale Superiore, Sala Azzurra conference room, Palazzo della Carovana, the following seminar will be held: Anna Cannavò (HISOMA CNRS) “L’eteocipriota: stato dell’arte e novità recenti”. Dire[...]. 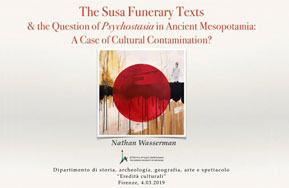 On March 4th, the seminar “The Susa funerary texts & the question of psychostasia in Ancient Mesopotamia: a case of cultural contamination?” will be held by Nathan Wasserman (The Hebrew University of Jerusalem) at 3 p.m. at the Dipartimento di Storia,[...]. The workshop "Epigrammata 5. 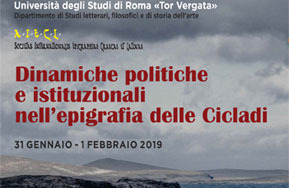 Dinamiche politiche e istituzionali nell'epigrafia delle Cicladi" will take place in Rome, Università di Roma Tor Vergata, "Roberto Pretagostini" conference room, from January 31st to February 1th 2019. Program available her[...].